YELLOW SUMMER SQUASH | Jane Lear. Writing on Food and Travel. I stopped trying to figure out whether I’d just been insulted long ago. Fact is, even though squash casserole reminds me of lunches with Savannah friends, companionably squeezed in among the tourists at Mrs. Wilkes’ dining room (“anthropology in action,” one pal would always mutter), I don’t really care for it all that much. All sorts of things that don’t belong have crept into squash casserole recipes, from Campbell’s Cream of Mushroom or Chicken soup to Pepperidge Farm herbed stuffing, and the end result usually tastes murky, too cooked, a dish bent on disguise instead of clarification. 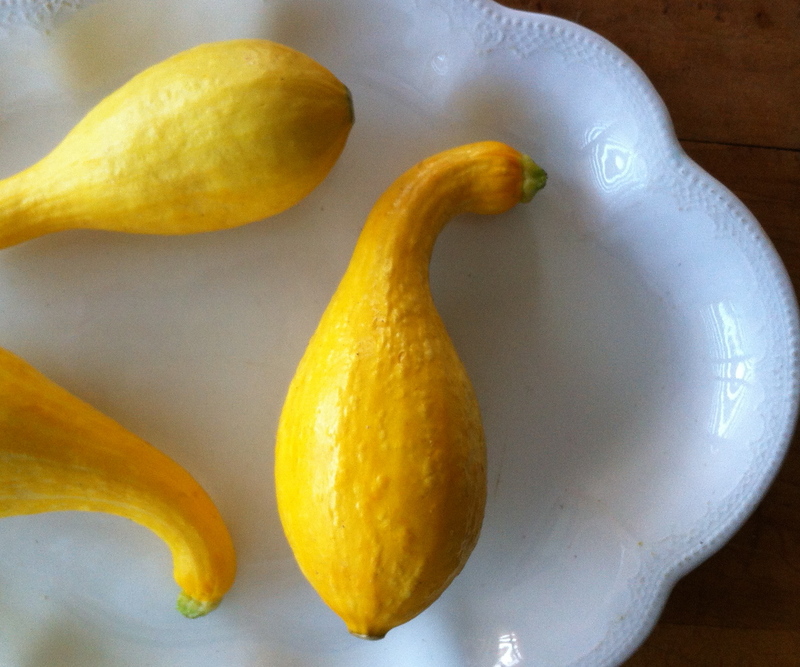 Yellow summer squash comes crookneck, straightneck, or somewhere in between. For my money, crookneck has the most flavor and, underneath its tight, warty skin, the firmest flesh. It’s an old variety. According to correspondence between Thomas Jefferson and Philadelphia Quaker Timothy Matlack in 1807, it was native to New Jersey, and, in Heirloom Vegetable Gardening, William Woys Weaver tells us that the summer crookneck is “the only squash that can be traced directly to the Lenape people who once inhabited the Delaware Valley.” It does not need an assist from canned soup. I cook mine a few different ways. Sliced thin and quickly sautéed, it’s a no-brainer weeknight side. Cut in half, slicked with olive oil, and grilled, its sweetness pops when paired with pesto or parsley-mint salsa verde. Very young specimens, with taut, unblemished pale skin, are delicious raw, sliced paper-thin on a Benriner—you know, the inexpensive Japanese mandoline-type slicer—and dressed with balsamic vinegar, flaky sea salt, and freshly ground pepper. If you happen to have a hunk of Parmigiano-Reggiano sitting in the fridge, a few shavings of that are nice on top. Recently, I came across a recipe for creamed squash in Classical Southern Cooking by Damon Lee Fowler, and I realized that the method of cooking summer squash whole is a very old one, in continuous use since Mrs. Randolph set it down in The Virginia Housewife (1824). Mrs. Randolph would have used young white cymlings (patty-pan squash) or crooknecks; after simmering them until tender, she would make a creamy, buttery rough mash. I can’t wait to try that sometime. Until then, I’ll do what my mother did, or, more likely, simply cut the cooked squash lengthwise into halves—I like preserving the elegant, alluring shape—and serve it with butter, which will begin to melt as soon as it hits its target. The plate in your hand will smell like summer. If this sounds too simple and plain, it’s easy enough to add some complexity. Mash together softened butter with a little freshly grated lemon zest and finely chopped fresh basil, then slather away. I serve summer squash with pretty much everything—fish, chicken, pork, even a juicy steak. It is also very good with nothing more than rice, leftover snap beans, a sliced garden tomato, and a few slices of crisp-fried bacon. 1. Wash the squash well but leave it untrimmed. Fill a pot with water and bring it to a boil. Add the squash, return the water to a boil, and reduce to a simmer. Simmer the squash until tender when pierced by a fork. Depending on size, this should take 15 to 20 minutes. 2. Drain the squash and just as soon as you can bear to handle them, cut lengthwise into halves. Top with butter and serve right away with salt and pepper. Posted: July 25th, 2012 under cooking, culinary history, favorite books, people + places, recipes, summer. Jane, I’ve been steaming whole squash and them using them similarly this summer at Crook’s. Lovely, Jane! Thank you for the mention. Sometimes we steam little freshly-pulled baby crooknecks whole and eat them in exactly the same way. Sometimes the simplest way is best, isn’t it?